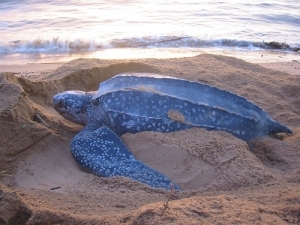 The Leatherback sea turtle (Dermochelys coriacea), sometimes called the lute turtle, is the largest of all living turtles, growing up to seven feet in length and weighing 2,000 pounds. They are named for their unique shell, which instead of being hard, is somewhat flexible and almost feels rubbery to the touch. The Leatherback has the largest range of any of the sea turtles as well as the longest migrations from feeding to mating habitats, measuring on average almost 4,000 miles. The biggest threats to the Leatherback are poaching, fishery bycatch, coastal development, and highly variable food availability. They have been previously listed as the most endangered sea turtle species, but due to effective conservation efforts, populations have begun to stabilize and their endangerment status has been changed from critically endangered to endangered.